So I’m trying my hand again at Tumblr. Macro-blogging no longer seems to be my forte, but I like gifs and micro updates, so Tumblr seems like the platform to do that. You can follow me over there, although I will be honest and admit that I’m still getting the hang of it. But it’s amandahocking.tumblr.com. I also believe there’s a feature where you can ask me questions, and I am open to receiving questions, and I am also very open to receiving tips on how to better enjoy my Tumblr experience. I guess my one issue with is that I see people reblogging all sorts of great and interesting content, but how do you find it in the first place? I’ve stumbled across a few neat things, but I don’t know how to figure how to find neat things consistently. Also, I’ve updated my All Books tab to include Trylle: The Complete Trilogy. It’s a 3-in-1 special edition paperback that includes Switched, Torn, and Ascend, and it’s coming out January 6, 2015. It’s a great way check out series if you haven’t already, or to introduce to any of your friends that haven’t read it yet. And it’s just time for the release of Frostfire, the first book in the spin off series, The Kanin Chronicles. And finally, in just some fun news, I got some fresh ink the other day. I’ve been plotting getting new tattoos to add to my arm for over a year, and I finally got around to do it earlier this week. 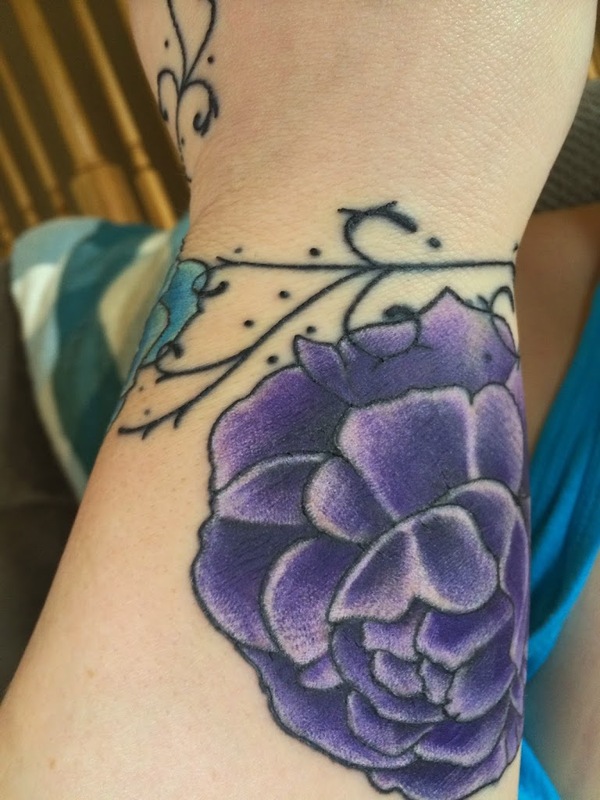 It’s a blue and purple peony, so I finally added some more color. I also had the black vines on my hand touched up, because they weren’t done very well the first time (or the second time around). 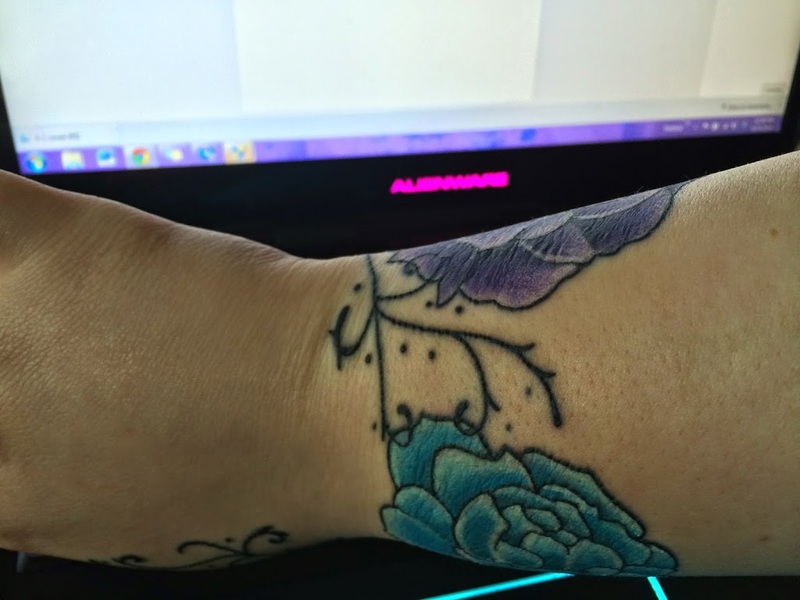 I cannot stress enough how important is to vet your tattoo artist. Ink is permanent. Make you sure get it done right. Good Job, Nice ink. I should show my sister this. Your books have the most beautiful covers. TORN is next in my TBR pile. Reading INKHEART at the moment. I LOVE your new tattoos. I hope to get some of my own soon! As for Tumblr, once you get the hang of it you will never want to leave! If you want more good content for your dash, try using search and tags relevant to your interests, so like tumblr.com/search/batman for really popular batman posts, or just tumblr.com/tagged/batman for all posts tagged batman, from newest to oldest. Also, when someone reblogs something you like and you want to see more content like that, follow the blog that they reblogged it from, as well as the person who posted it (the source). 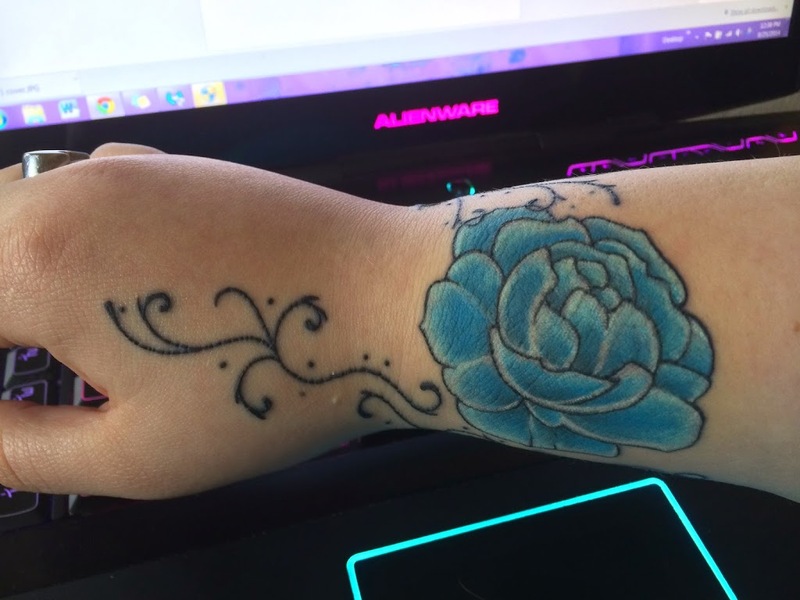 Love the new ink, peonies are my favorite flower! I am in the process of getting a geeky crossover tattoo done with the TARDIS, Serenity and the Enterprise. Its pretty badass. So excited to hear about the Frostfire series. We had chatted a few years back about a Trylle spinoff, glad to see it come to fruition. I am pretty sure if we had grown up in the same area we would have been good friends and geeked out together, haha. Shiny! How are you? I would like to congratulate you on your success as an author. I’m looking forward to purchasing you book FROSTFIRE. The cover is gorgeous. I love book covers that are attractive. As for me, I’m in the process of writing my manuscript. It’s entitled “FROM THE OTHER SIDE OF THE TRACKS.” It’s about a street racing thug and an affluent girl whose romance is disapproved by her self-centered father who makes a living in real estate. The process is going very slow and i want to make sure everything looks good. If you like you can go to my blog site :angelikaseven.blogspot.com and you can read a little more about me and an excerpt of one of my chapters. Talk to you later. God bless.